LOS ANGELES – January 2018 – American T-shirts, blue jeans and hot cars have merged to create the ultimate in high performance style from Southern California. The “Original Venice Crew,” (OVC) teamed up with Tees + Jeans, a retail concept by Lua + Sol Creative Agency, to create a unique consumer experience based on personalization. 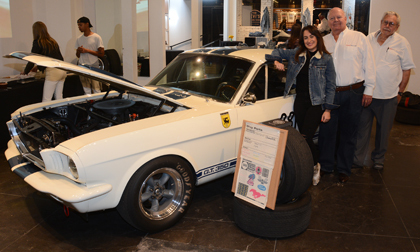 Continuing to pay tribute to the “Rebels of Venice,” the OVC Shelby GT350R is being featured and displayed this month as inspiration for custom t-shirts and Levi denim at the storefront on Abbot Kinney Blvd. in Venice, California. The store is a few blocks from the original Princeton Street Garage where the OVC began. The Original Venice Crew began their work for automotive icon Carroll Shelby in the early ‘60s, with design and fabrication on both the early Shelby Cobras and, soon after, the first Shelby Mustangs. Today, the “original” crew builds continuation 1965 Shelby GT350 “R” models at the Shelby Los Angeles facility under license by both Ford Motor Company and Shelby. The 2,700-square-foot Tees + Jeans store is a partnership between Levi’s and Junk Food Clothing. Consumers walk into a visually engaging gallery-like setting, complete with inspirational apparel items designed with fonts, pins, patches and graphics, and can create their personal style, inspired by monthly activations, in the Levi’s Tailor Shop. The OVC Shelby GT350R evokes the raw performance of the era, while Tees + Jeans infuses its fashion with an elemental style appropriate to any era. The Shelby GT350R will be displayed in the Venice store at 1103 Abbot Kinney Blvd for the next few weeks. Next, it will be displayed at the Barrett-Jackson auction in Scottsdale, Arizona from January 13-21. The Concours in the Hills asked OVC Shelby to take center stage at their event in Fountain Hills, Arizona on Feb. 10. Additional information about OVC is available at www.ovcmustangs.com and more information on Tees + Jeans is available at LeviStrauss.com. A video of the store opening is available at https://vimeo.com/249844796.